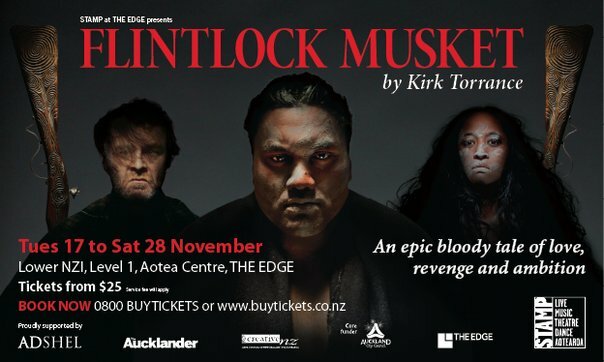 Flintlock Musket by Kirk Torrance was my most anticipated play of the year.?? It delivered everything I want – drama, dance and a teeny bit of magic.?? I loved it!?? Flintlock Musket was picked up as part of the STAMP development programme.*?? It was workshopped a couple of times last year.?? This November was the premiere season for what STAMP are saying is Part One of a three year plan.?? THREE YEARS!?? That's at least three more times that I'll be able to see it.?? So – it's set pre musket-wars NZ and the story is that the chief Aoraki (Maaka Pohatu – that's him in the middle) has sent his son Toki (Jarod Rawiri) off to fight another iwi on his behalf.?? Toki is upstaged by the Aoraki's mokai-pakeha/pet, Mason, (Jason Whyte – on the left) who is rewarded for his part in the battle with the gift of Aoraki's whaangai daughter and slave, Hine (Nancy Brunning – on the right).?? Supporting characters are played by Scott Cotter (watch for his death/s! ), Taane Mete and Wairangi Herewini. There's an ensemble (Jack Gray (also Movement Director) Tamihana Paurini, Regan Taylor, Maria Walker, Nancy Wijohn) who provide support and punctuation to the dramatic bits.?? It was inspired by Macbeth so it's not a spoiler to say that death, and destruction, and DOOM, rain down upon the protaganists. There are a whole bunch of talented people working on this show.?? Rachel House (Director) manages to wrangle the performers around the vast open set (designed by John Verryt; lighting design by Jeremy Fern).?? She has a large cast to direct plus there's music (Tama Waipara, Sean Lynch and Tweedie Waititi) and movement to incorporate as well.?? There was a fairly tight rehearsal period (seems like there always is) which must have been particularly difficult for a completely new show like this one.?? There are complicated space/time movements within the script.?? These weren't so clear to me on opening night but by closing night those changes were more defined. *?? "Flintlock Musket was developed as part of a Playmarket's Pasifika Playwrights Programme and THE EDGE Double Shot Programme" according to the programme. As part of the Kiss My Arts thing I have to visit somewhere (anywhere) and then write a post about it. I've been down in Wellington so the generous week allowed kinda turned into a bit of a nightmare.?? The work thing that I was at was held at Te Papa and everyday I had to walk past the City Gallery.?? It's hard to miss at the moment what with the measles and all.?? It took me far too long to think that could be the solution. The City Gallery is hosting an exhibition – Yayoi Kusama: Mirrored Years.?? She's a Japanese artist who was first big in the 1960s and has steadily produced work ever since.?? She's focused on perception, the concept of infinity and polkadots.?? I found it all quite surreal and awe inspiring. : the room with the large clouds.?? Nice juxtaposition of very detailed screenprints on the walls with large fuzzy puffy balloons on the floor. : the infinity room on the ground floor.?? It was like being suspended in space only all the stars are colured and twinkly. : being able to get into the art and walk around it. I’m super excited to be on the longlist for the Kiss My Arts social media experiment in Auckland facilitated by THE EDGE. In 2009 I made a real effort to get to plays and theatre around Auckland. I subscribed to the Silo Theatre season, went to a couple of Auckland Theatre Company things, bought tickets for some of the STAMP shows, even got to the Unitec grad show. I regularly go to LATE at Auckland Museum and since I have a friend in Auckland Choral and a sister in the Atamira Dance Collective I go to see them too. The thing is though…all the other things are a confusing mish-mash of traditions and behaviour that I just can’t get through. Comedy? Art? Music? Ballet? Anything that isn’t people-I-know-in-stuff? *shrug* I don’t understand it and I’m too lazy to get out of my comfort zone which is why I’m stoked that I’m being considered to transition from ‘arts novice to cultural aficionado’. As part of Kiss My Arts I have to blog about the stuff I do. I’ve been tweeting reviews, so expanding beyond the 140 might be a bit of a challenge. However, I’m up for it. AND, regardless of whether I’m in or I’m out I’ve decided that I should do it anyway and I want you to join me.